The chloroplast, found only in algal and plant cells, is a cell organelle that produces energy through photosynthesis. 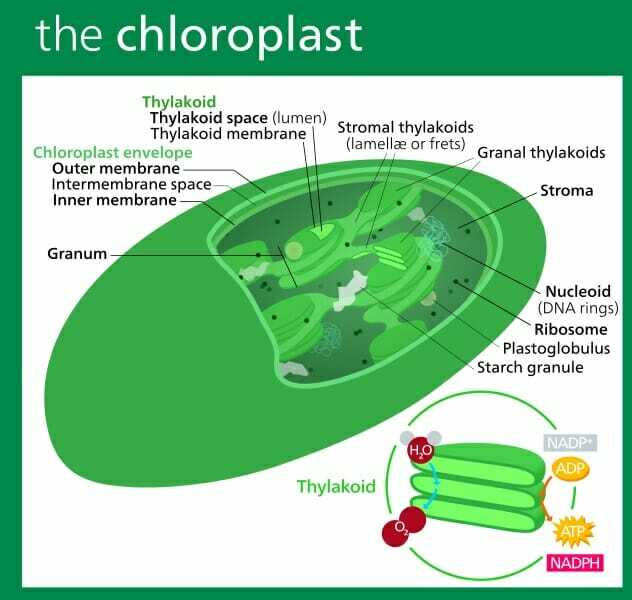 The word chloroplast comes from the Greek words khloros, meaning “green”, and plastes, meaning “formed”. It has a high concentration of chlorophyll, the molecule that captures light energy, and this gives many plants and algae a green color. Like the mitochondrion, the chloroplast is thought to have evolved from once free-living bacteria. Chloroplasts are the part of plant and algal cells that carry out photosynthesis, the process of converting light energy to energy stored in the form of sugar and other organic molecules that the plant or alga uses as food. Photosynthesis has two stages. In the first stage, the light-dependent reactions occur. These reactions capture sunlight through chlorophyll and carotenoids to form adenosine triphosphate (ATP, the energy currency of the cell) and nicotinamide adenine dinucleotide phosphate (NADPH), which carries electrons. The second stage consists of the light-independent reactions, also known as the Calvin cycle. In the Calvin cycle, the electrons carried by NADPH convert inorganic carbon dioxide and to an organic molecule in the form of a carbohydrate, a process known as CO2 fixation. Carbohydrates and other organic molecules can be stored and used at a later time for energy. Chloroplasts are essential for the growth and survival of plants and photosynthetic algae. Like solar panels, chloroplasts take light energy and convert it into a usable form that powers activities. However, a few plants no longer have chloroplasts. One example is the parasitic plant genus Rafflesia, which obtains its nutrients from other plants—specifically, Tetrastigma vines. Since Rafflesia gets all of its energy from parasitizing another plant, it no longer needs its chloroplasts, and has lost the genes coding for the development of the chloroplast over a long period of evolutionary time. Rafflesia is the only genus of land plant known to be lacking chloroplasts. Chloroplasts, like mitochondria, are oval-shaped and have two membranes: an outer membrane, which forms the external surface of the chloroplast, and an inner membrane that lies just beneath. Between the outer and inner membrane is a thin intermembrane space about 10-20 nanometers wide. The space within the inner membrane is called the stroma. While the inner membranes of mitochondria have many folds called cristae to absorb surface area, the inner membranes of chloroplasts are smooth. Instead, chloroplasts have many small disc-shaped sacs called thylakoids within their stroma. In vascular plants and green algae, the thylakoids are stacked on top of one another, and a stack of thylakoids is called a granum (plural: grana). The thylakoids contain chlorophylls and carotenoids, and these pigments absorb light during the process of photosynthesis. Light-absorbing pigments are grouped with other molecules such as proteins to form complexes known as photosystems. The two different kinds of photosystems are photosystems I and II, and they have roles in different parts of the light-dependent reactions. In the stroma, enzymes make complex organic molecules that are used to store energy, such as carbohydrates. The stroma also contains its own DNA and ribosomes that are similar to those found in photosynthetic bacteria. For this reason, chloroplasts are thought to have evolved in eukaryotic cells from free-living bacteria, just as mitochondria did. This diagram shows the parts of a chloroplast. Chloroplasts are thought to have become a part of certain eukaryotic cells in much the same way as mitochondria were incorporated into all eukaryotic cells: by existing as free-living cyanobacteria that had a symbiotic relationship with a cell, making energy for the cell in return for a safe place to live, and eventually evolving into a form that could no longer exist separately from the cell. This is called the endosymbiotic theory. The evidence that chloroplasts evolved from bacteria is very similar to the evidence that mitochondria evolved from bacteria. Chloroplasts have their own, separate DNA that is circular, like that of a bacterial cell, and inherited maternally (only from the mother plant alga). New chloroplasts are formed through binary fission, or splitting, which is how bacteria reproduce. These forms of evidence are also found in mitochondria. The one difference is that chloroplasts are believed to have evolved from cyanobacteria, while mitochondria evolved from aerobic bacteria. (Mitochondria cannot photosynthesize; the process of cellular respiration occurs there instead.) The structure of chloroplasts is similar to that of cyanobacteria; both have double membranes, circular DNA, ribosomes, and thylakoids. Most chloroplasts are believed to have come from one common ancestor that engulfed a cyanobacteria between 600-1600 million years ago. Thylakoid – Flattened disks within the stroma of the chloroplast that contain chlorophyll and carotenoids, and perform photosynthesis. Photosynthesis – The conversion of light energy into chemical energy in the form of organic molecules. Symbiotic relationship – A close biological interaction between two different species. Algae – A large group of photosynthetic organisms including seaweeds, giant kelp, and diatoms. 1. What is a difference between mitochondria and chloroplasts? A. Chloroplasts have an outer and inner membrane, while mitochondria do not. B. Chloroplasts are thought to have evolved from bacteria, while mitochondria are not. C. Photosynthesis occurs in chloroplasts, but not in mitochondria. D. Mitochondria have their own DNA; chloroplasts do not contain DNA. C is correct. Photosynthesis only occurs in chloroplasts, not mitochondria. Choices A, B, and D are all incorrect because mitochondria and chloroplasts have all of these things in common; they are thought to have come from bacteria, have their own DNA, and have two membranes. 2. In which part of the chloroplast does photosynthesis occur? B is correct. Photosynthesis occurs in the thylakoids of the chloroplast. Thylakoids contain chlorophyll and carotenoids, which are all pigment molecules that can capture light energy and turn it into chemical energy. 3. What are chloroplasts thought to have evolved from? B is correct. Chloroplasts are thought to have evolved from an ancient form of cyanobacteria, which is a type of photosynthetic bacteria. Mitochondria evolved from aerobic bacteria. The Rafflesia plant is a rare example of a plant that does not contain chloroplasts.